Tammy arrived at Stanford University as a staff Physical Therapist in 2007. 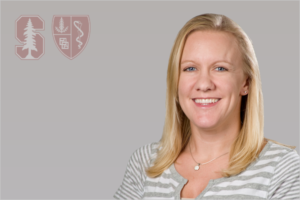 While providing clinical care to student-athletes from all 36 Cardinal sport teams, Tammy also assumed a vital leadership role in a variety of projects within the sports medicine organization. This culminated in her advancement to Director of Physical Therapy in 2013. In that role, Tammy has helped to design and implement the Physical Therapy side of Stanford’s concussion management protocol. While enjoying the challenge of providing treatment of all types of movement impairments, Tammy holds a special interest in foot/ankle pathology, lower extremity mechanics, and running. She is the primary PT for the Cross Country and Women’s Basketball teams, and a secondary PT for the Track and Field team. Tenforde, AS. Watanabe, LM. Moreno, TJ. Fredericson, M. Use of an Antigravity Treadmill for Rehabilitation of a Pelvic Stress Injury. PM&R Journal. Aug 2012. Volume 4(8), pp 629-31.